Winter comes early in Banff and with it comes snow. Lots of it. Having sidewalks cleared in a reasonable amount of time makes it much easier and safer for everyone to get outside and get around. Did you know it’s your responsibility to clear your sidewalk? The Town of Banff Streets and Public Place Use Bylaw (PDF) requires an owner or occupier of a property to clear all adjacent public sidewalks of snow and ice within 24 hours of the last snowfall. This means down to the bare concrete or pavement. Failure to clear sidewalks could results in a fine of $100. That fine may be issued to the occupant and/or the registered property owner, but ultimately the registered property owner is responsible for clearing the sidewalk. 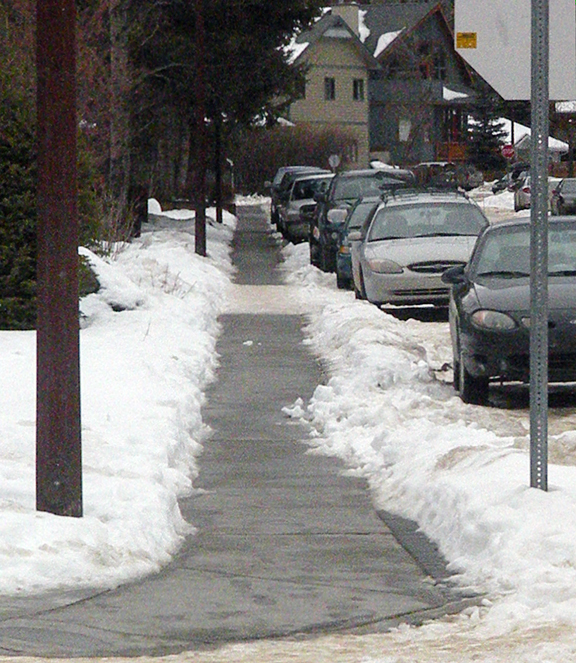 If sidewalks remain snow covered after an initial warning or fine has been issued, the Town of Banff may clear that sidewalk for a fee charged back to the registered property owner at the cost of the work, plus 25%. If you are senior or have a mobility restriction, check out the Snow Angels program to get help clearing your sidewalk.